Whether you are new to being in practice or business or a seasoned professional, this 12 Lesson program will help you get the clarity you need to build or revitalize your clientele and business. Each lesson will help you uncover your true desires for your business, eliminate hidden roadblocks, and discover new techniques for reaching and keeping your ideal clients. ALSO AVAILABLE IN USB FORMAT! If you would prefer USB over CDs, please indicate in your order. El éxito a largo plazo de cualquier negocio de Masaje, Spa o Bienestar depende de crear relaciones fuertes y ventas periódicas con los clientes existentes. El objetivo es que, además de que le visiten regularmente, recomienden su negocio a todos sus conocidos. Si le cuesta trabajo retener a sus clientes y lograr que reprogramen sus citas y si descubre que está perdiendo su tiempo, dinero y energía al concentrarse en atraer nuevos clientes a su negocio, entonces debe comprar este libro. El libro Clientes Para Toda La Vida, que ya es un Bestseller en Amazon, le ayudará a descubrir exactamente quiénes son sus clientes perfectos, además de enseñarle varias técnicas sorprendentemente sencillas y altamente efectivas para lograr que sus Clientes Para Toda La Vida ideales le visiten repetidamente y recomienden su negocio. De manera gratuita y sencilla… ¿Está listo para sentirse seguro y ser efectivo al rentabilizar su negocio? ¡El libro de Felicia está aquí para ayudarlo! Ready to feel confident in marketing your business? This book will help you get where you want to be in your life and career faster by helping you determine exactly what you want and need to do in your marketing, who you want to reach through many simple, fun and affordable techniques and promotions. 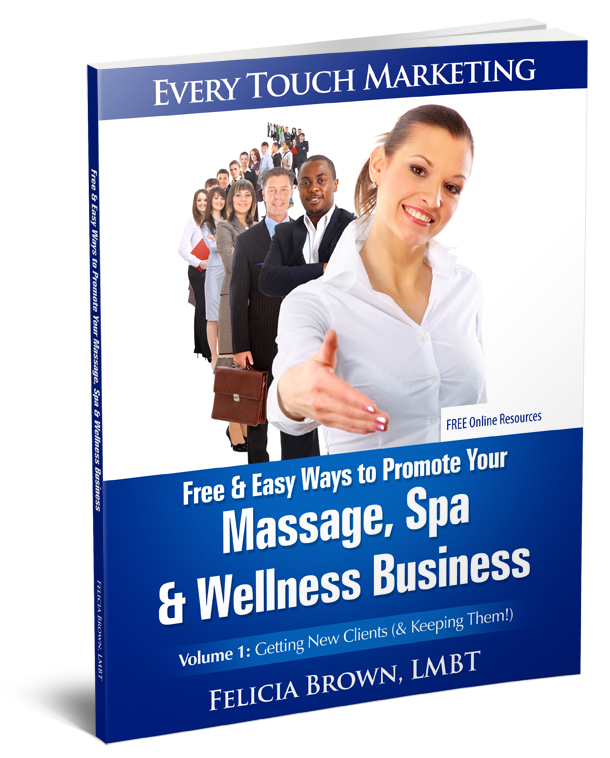 Each chapter and strategy in Free & Easy Ways to Promote Your Massage, Spa & Wellness Business: Volume 1 will help you move closer to achieving the vision you have for your practice, clinic, or business; connect with and keep your ideal clients; and create a profitable business. Aprenderá cómo obtener (y mantener) clientes de manera fácil y económica con este extraordinario libro de mercadotecnia ¡único para profesionales de la industria del masaje, el spa y el bienestar! Cada capítulo y estrategia de Every Touch Marketing: Maneras Sencillas Y Gratuitas De Promocionar Su Negocio De Masajes, Spa y Bienestar le ayudará a lograr la visión que tiene para su práctica, clínica o establecimiento, a conectarse con nuevos clientes y a crear un lucrativo negocio. De Parte de Felicia: “Este libro le ayudará a ganar más dinero y a llegar más rápidamente a donde desea estar en su vida y en su carrera al ayudarle a determinar exactamente qué desea y qué necesita hacer a través de su mercadotecnia, y a quién quiere llegar a través de simples, económicas y divertidas técnicas y promociones”. Felicia Brown’s newest inspiration is out! The second in her series of healing gift books, Wisdom of the Stone, provides the reader with timeless insights and incredible photos obtained during an unexpected walk along the Maine coast. By taking time to listen to the wise words of a smooth grey pebble, you too will feel your mind clear as you make sense of your own journey. A wonderful tool for reflection or meditation as well as a thoughtful gift. 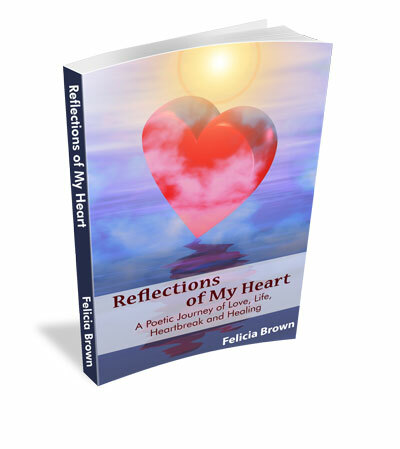 is a collection of personal musings and essays written by best-selling author, Felicia Brown, which explore the curiosities of life. As both a seeker and (over) thinker, Brown looks not only for the meaning contained inside the events she experiences, but also the hidden lessons, wisdom and gifts. Brown invites readers deep into her heart and healing journey with stories from all areas of her life. In particular, she shares insights and experiences of overcoming adversity, fear, self-doubt, loss and grief to find courage, confidence, inspiration, forgiveness and peace. Her words are authentic and provide many opportunities to learn how to move from difficulties and dark times back into the light. 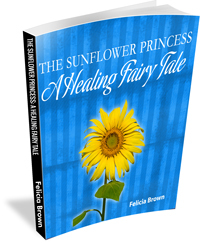 The Sunflower Princess: A Healing Fairy Tale tells a lyrical story about a little seed that has been unexpectedly swept away from her familiar world into one of difficult times and isolation. Through her journey, she learns to have hope and, eventually, “to grow and bloom like no other.” The lessons from the story will speak to almost anyone who has dealt with loss, grief, depression, addiction/addiction, isolation, illness and many other life or personal challenges. Described by one reader as “a wonderful tool to achieve harmony within” and “a thoughtful & magical gift for a friend or family member in need of meaningful healing” this book was written with adults in mind, but is totally appropriate for children of all ages. The book is intended to bring the reader healing, hope and inspiration to move forward. A collection of Felicia’s original, introspective poetry. The poems span a period of more than fifteen years and take the reader through a progression of a broad spectrum of relationships, emotions and experiences through verse and rhyme. Through this revealing and soul-baring compilation, Felicia is sharing her “story” and struggles around personal and romantic encounters. The goal in doing so is to provide hope and empathy for others dealing with their own frustrations and losses…and to show that there is hope and life on the other side of every relationship. Click here to purchase THE WORKS!